First dip into the pool. | House by the water. Thanks LJH. We did get a quote for “hideaway rollers” originally through our landscape designers, but it was in excess of $7K (incl. installation). I’m hatching a plan for a bench seat/ outdoor sofa with built in storage for the pool blanket. My husband is threatening to make us a sofa (after last week’s sofa post and price revelation), so I’m redirecting him to make an outdoor sofa! That’s great that the pool goes in now. We were just saying our pool will be in for the future grand kids. Haha! Your mood board looks lovely. It will be great sitting in the pool looking out at that beautiful water. :). Ooh I like those sunloungers! Just had a look at the video on their website – they look amazing. And I was just about to start looking for outdoor furniture…. Cameron’s been looking into the liquid pool “covers”. I’m not sure if they will work – but hopefully we’ll be able to find out soon. It is all looking beautiful. The lounges are cool, aren’t they? I think you can rock them. When I checked them yesterday, they had a sale on. (Still not cheap though.) I will be very interested to hear about the liquid pool covers. I can recommend Leisure Pools. They weren’t the cheapest quote but delivered exactly what they promised – which is rare in our experience. We discovered a small tip (tiles, granite boulders, old toilet cistern….) when they dug the hole but they disposed of all the rubbish at no extra cost – but a lot of extra work to them. After sales service excellent too. Thanks Anne. That’s great to hear. I’ll pass it on. Hm, that’s an interesting factoid about why the pool needs to go in first. Mood board is great. Love the outdoor shower, and the sun lounge looks awesome. I shudder to think of the price though! “Factoid”? You make me laugh. Do I detect some suspicion in your tone? I wonder if the building “experts” with their off-hand comments know that I am going to quote them. All I can say, Trixee, is don’t take my word for it! The price of outdoor furniture can surely be high. I thought we might buy some here in Brazil, but the situation is worse here. My husband and I really like these ones (though I’d like to test their comfort). We need something solid that can be left out in the weather and won’t be blown away. Hehe, no, no suspicion. Just confirms what I thought, but when I was doing my research (when we were still dreaming we’d be able to afford a pool), no-one seemed to mention it. Perhaps I didn’t press hard enough. In the end, we decided that even if we were to get a pool, we wouldn’t have it close to the house because of safety regulations, and it wouldn’t work with our plans to have the sliding stacker open onto the deck. (Pool fencing regs here are stupidly tight, in my opinion). Yes, you may note that there will be fencing all around our pool, but nothing between us and the canals. Like the mood board Jo. We just happened to have a meeting about our proposed pool yesterday.We went through the same dilemma of fibreglass versus concrete and ended up with concrete. We have had many pools over the years and been happy with both but in the end it came down to being able to put in the exact size,shape etc that we wanted. Yes, quite a bit more expensive. 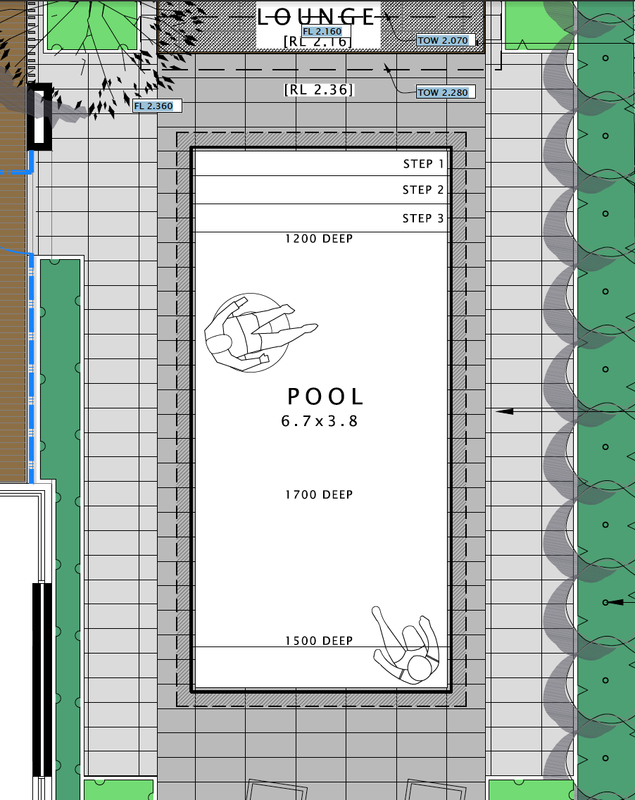 In fact our pool is a very similar design with steps at the one end and 2.5m width x 12m length and depth 1.2 – 1.8. We have access down the side of our property so the builder and pool people recommended installing after the house is up and whilst the builders are working on the inside. This would avoid having to work around it, covering it over etc. No one mentioned deeper footings. To be honest I leave all the technical ‘stuff’ to my better half and he is the one that likes dealing with that and knows what he is doing! I like doing the ‘pretty’ stuff like tiles etc. I do know we have changed to a salt water filter after his research and our previous experiences but again comes down to personal preferences. We are having the pool people put in a 3m water feature wall (next dilemma for me what to put on it), heating and pool blanket and will all be overseen by the builder. Looking at our current shedule (and you know how flexible they can be!) they will probably start that in about 6-8 wks and then come back and finish it off when the house is fnished. I forgot to mention A1 in Balcatta are doing our pool. So far we have been very happy with them – very down to earth and practical. I will let you know how we go. Let me know if you want any other info. Thanks for all the info Deb. I think the footings depends on the proximity of the pool to the house and boundary also. You will be able to swim laps with 12 metres length. I will be very interested to hear what you decide for heating, tiles, blanket etc. We have a vague idea of solar heating our pool water on our roof, but haven’t scratched the surface of that yet. I do know that a pool needs to be at least 24 degrees C before I will get in, but my kids couldn’t care less. Ha ha Jo I’m with you on the temp of the water. That is the ‘intention’ to swim laps – lets see if it happens! Our solar heating for the pool is going on the pergola which is a north facing skillion roof covering 3/4 of the pool. Once we have the details I can forward them to you. Our blanket will be in a wooden storage/seating at the eastern end (part of our landscape plan). What an exciting stage! Your advice on the pool vs house footings is consistent with what we;ve been told. All has to do with the proximity of nearby walls and fences. Concrete is def the way to go. Our new pool will be almost the same size as yours – 7 x 4m. We have gone with an ozone filtration system (hydrypure or something like that) which minimises the need for chemicals and also the outdoor shower afterwards. More expensive but helpful with little kids around, especially ones with blind hair that can become green swimming in chlorine everyday of summer. We are also going the hidden roller cover – think our quote fully installed (including builders margin) was $6.5k. Can also recommend from experience installing a heat pump (a bit like a reverse-reverse cycle air conditioner in that it extract heat from the ambient air temp …. Igor should love it as an engineer). Costs about as much to run as the pump used to get water onto the roof for solar heating purposes. Works very well and allowed us to swim from the start of Sept to the end of April at our last house. Our new pool should be started within the month, so we won’t be far behind you then. Thanks for the tips Sarah. I will pass them on to the Chief-in-charge of the pool. The heat pump option is good to know, because I’m not sure if we are going to have enough suitable roof for solar heating requirements, particularly because we also plan to install solar panels for electricity. Our pool shell is finished now. (I’ll post pics in a couple of weeks.) Now it gets boarded up until the house is built, then it will be finished. Is this the same for you? Are you doing pool first?